Thumbtack Smoothie is a member of the psycho trip-out hip-hop ensemble Pancake Circus that we reviewed in AI #15. Venturing out on his own, the smooth one has produced a set of experimental but accessible electronic adventures that utilize a banquet of equipment including drum machines, samplers, turntables, synths, and virtually everything that could be found in a fully stocked Toy 'R Us store. There's really quite a lot going on here and new elements reveal themselves with each listen. Drum 'n Bass, Dub, hip-hop, and various other dance rhythms combine with spacey bubbling synths, countless samples, and childlike melodies to create a crazed collection of freakout tunes. The spaced out zaniness reminds me most of Vas Deferens Organization in the way that careful editing is a large part of the resulting mix. Pulsating flying saucer sounds, hip-hoppy beats, and non-stop transitional twists and turns keep the music flowing and the ride fun and intense. I got a kick out of the sample of the modem handshaking that's strategically edited in on one track to add an even freakier ingredient to the ubiquitous alien sounds. Overall, I'd say Thumbtack Smoothie has done an impressive job of creating chaos, yet forcing it down a controlled, linear path. This may well be the freakiest music I've ever heard that can still [almost] be danced to. Fans of Vas Deferens Organization, Faust, and the Residents put on your toe-tappin' shoes and step right this way. 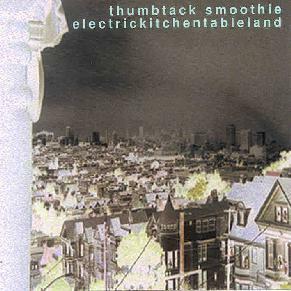 For more information and to hear sound samples you can visit the Thumbtack Smoothie Mp3.com web site at: http://www.mp3.com/thumbtacksmoothie. Electrickichentableland can be purchased through Cdbaby.com at: http://www.cdbaby.com/cd/thumbtacks. Contact via snail mail c/o Quaketrap Recordings; 915 Cole Street; Box 135; San Francisco, CA 94117.